So today was the last day of my Nature Challenge due to skipping a day for steam. 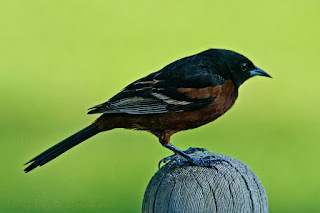 :-) This is an Orchard Oriole which is much darker than the bright Baltimore Orioles. It was sitting on the railing waiting for it's turn at the jelly which is just out of sight to the right. The Orioles usually disappear when the Mulberries are ripe but this year they still seem to be enjoying what we provide. I saw one having a drink just this morning.